Before the advent of Silicone Diffusion Pump Oils about 20-25 years ago. Hydrocarbon Diffusion Pump Oils ruled the Vacuum Industry. These oils are prepared from base oil that has been distilled from crude oil and purified by Dewaxing and Solvent extraction. This is further purified by additional vacuum distillations. Famous hydrocarbon oils brands are Supervac Hydrocarbon Diffusion Pump Oil(SV-DELTA), Apiezon C and Convoil 20. Silicone Diffusion Pump Oils on the other hand are made by controlled hydrolysis of Silanes, addition of Phenyl groups followed by Distillation. Famous Silicone Diffusion Pump oil brands are Supervac Ultra high Vacuum Silicone Diffusion Pump Oil (SV Sigma) and DC704. Table below gives the comparison of both these oils, this will help user decide which particular oil is better for a particular application. 1) Cost of operation has to be kept very low. 2) Operation contaminates oil quickly. 3) Equipment is very old therefore working life of oil and vacuum level will remain low irrespective of oil used. For all other applications Silicone Diffusion Pump oil is suitable. 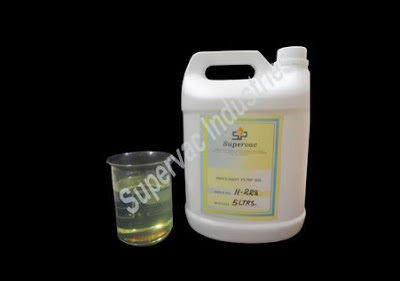 Supervac Industries manufactured Silicone Diffusion Pump oil SV-Sigma is one of the best Silicone Diffusion Pump oils available in the world.